Last week at the Ireland and UK Moodlemoot 2012, I did a short presentation on IMS LTI. I have blogged before about IMS LTI; what it is; how Moodle could use it; and how a custom Module enabled Moodle act as a LTI provider tool. Before explaining LTI, What is IMS? The IMS Global Learning Consortium (IMS GLC) is a global, nonprofit, member organization that strives to enable the growth and impact of learning technology in the education and corporate learning sectors worldwide. IMS is developing Learning Tools Interoperability (LTI) to allow remote tools and content to be integrated into a Learning Management System (LMS). So basically it is a set of standard integration methods that enable two systems talk to each other in a common language/protocol. Feel free to post any questions & comments below. Thanks for showing how easily WebPA can be connected to a VLE in your demonstration. Here are a few more resources which anyone interested in discovering more about LTI might find useful. With LTI 1.1 (or using the unofficial extensions to LTI 1.0/Basic LTI) it is also possible to have grades passed back to the VLE (a more complete illustration of how WebPA uses LTI can be found on the ceLTIc project blog at http://www.celtic-project.org/Project_blog/2011/11/An_instructors_view_of_LTI). Thanks for posting this, Gavin. It’s useful to show others how powerful LTI is. The one thing I am still having trouble with is configuration and settings, and I cannot seem to find comprehensive instructions or tutorials. In your video you show, for example, a connection to WordPress. How do I set this up so that WP (or another Moodle) recognises our demo 2.2 Moodle user’s login credentials? I feel like I am one puzzle piece short of getting this thing to work. 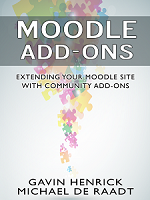 The Moodle-Moodle connection uses the http://www.somerandomthoughts.com/blog/2012/01/08/review-lti-provider-for-moodle-2-2/ plugin. Both have the details to set them up. Thanks Gavin, will check those links out!